Stone Castle Recycling operated an electronic recycling company at three locations—Clearfield, Parowan, and Cedar City. Stone Castle accepted a variety of electronics, including cathode-ray tube (CRT) televisions, to scrap and to sell as raw materials. The recycler separated and crushed the leaded-glass vacuum tubes inside the televisions and sent some of the CRT glass for recycling into new, leaded-glass CRTs. 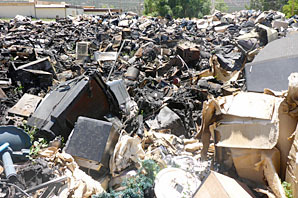 The Division of Waste Management and Radiation Control (DWMRC) asked the Environmental Protection Agency (EPA) to conduct cleanup actions at the Stone Castle Recycling facility site in Parowan following a fire that destroyed large stockpiles of electronic waste stored on the property. Electronic waste, or e-waste, is a growing problem in Utah and across the country. Electronic products become obsolete quickly, resulting in the generation of almost 3.5 million tons of e-waste per year. Electronics are designed to be disposable rather than recyclable and contain toxic materials such as lead, mercury, and cadmium that must be removed before they can be recycled. If recycled electronics are not managed properly, these toxins can contaminate soils or leach into streams and ground water. 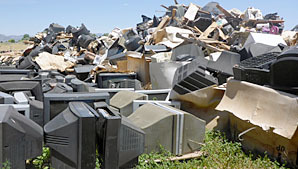 The vast majority of the electronics that consumers discard go to landfills or incinerators. Even e-waste that is recycled may still end up in landfills if the recycler cannot find a buyer for the materials. Stone Castle Recycling operated an electronic recycling company at three locations—Clearfield, Parowan, and Cedar City. Stone Castle accepted a variety of electronics, including cathode-ray tube (CRT) televisions, to scrap and to sell as raw materials. The recycler separated and crushed the leaded-glass vacuum tubes inside the televisions and sent some of the CRT glass for recycling into new, leaded-glass CRTs. As plasma and LCD high-definition televisions became more popular, the market for leaded glass evaporated. The downturn in the leaded-glass market left Stone Castle with large quantities of glass, which it stored on the ground in open, corrugated-cardboard containers. Intact CRT televisions also began to pile up at the recycler’s facilities. In December 2013, DSHW issued a Notice of Violation and Compliance Order (903 KB) to the company after a division inspector visited the Parowan site and found that the company was engaged in recycling activities without an approved plan of operation and was improperly handling and disposing of solid waste materials. As part of that NOV/CO, the division ordered Stone Castle to Cease and Desist all recycling and storage operations at the facility and to remove all recyclables and solid wastes that were stored outside by January 10, 2014. The company was unable to meet the deadline or several subsequent deadlines. In March 2014, a fire at the Parowan facility destroyed large piles of CRT televisions that were being stored outside. After the fire, DSHW told the company that it had to conduct an environmental assessment of the site to determine whether the soil and ground water had been contaminated. DSHW gave Stone Castle until September 30, 2014, to clean up the site, but the company abandoned the electronics stockpiled at the facility. Other Stone Castle facilities experienced similar problems, including separate fires that broke out at its two other locations. In April 2013, DSHW inspectors visiting the Clearfield site discovered that the company was storing broken CRTs outside the facility in cardboard Gaylord boxes. These boxes were not properly labeled, filled, or closed to minimize releases of the contents to the environment, and many of them had leaked or spilled CRTs and CRT leaded-glass on the ground. DSHW learned that Stone Castle had sent 304,000 pounds of crushed CRT glass to the Grassy Mountain facility for disposal. The company had characterized the crushed glass as non-hazardous solid waste on the waste manifest. Division inspectors subsequently took samples of the glass and submitted them to the Utah State Health Laboratory for analysis. All four samples exceeded the Toxic Characteristic Leaching Procedure (TCLP) limit for lead (81 KB), which confirmed that the crushed CRT glass was by definition hazardous waste. Inspectors also found that Stone Castle failed to properly manage light bulbs containing mercury and failed to immediately clean broken lamps that could release mercury or other hazardous substances into the environment. In addition, Stone Castle did not have an approved plan of operation for storage or recycling of solid waste at any of its facilities. In October 2013, DSHW issued a Notice of Violation and Compliance Order (4.2 MB) for Stone Castle’s electronic waste recycling, storage, and disposal and fluorescent tube processing operations at its Clearfield facility. All three locations have since been abandoned by Stone Castle, leaving large stockpiles of CRT televisions in various states of disassembly at the company’s former sites. 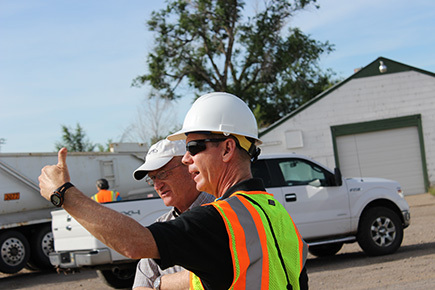 DSHW asked the EPA to assist with the cleanup at the Parowan site as part of an emergency response to protect public health and the environment. The EPA’s onsite coordinator visited the Parowan facility in August to identify options for dealing with the remaining electronic waste. The agency gained legal access to the site in October and expects to conclude its cleanup operations in December 2014. The EPA intends to remove the abandoned and burned televisions to minimize the risks to public health and the environment. There are currently no plans perform cleanups at other locations.